Additive manufacturing technologies are a set of tools that can complement the current scale technologies used by companies. These technologies are facilitators for Industry 4.0 and can provide companies with digital manufacturing capacity at reasonable costs. This capacity will improve and increase thanks to the evolution of equipment and technologies, along with the development of new higher-performance materials, new functionalities and optimised costs. The most used 3D printing technologies are those that build using polymers and the most popular and accessible one is based on extrusion 3D printing (FDM or FFF). Additive manufacturing is a strategic specialisation line within the Plastics and Composites Area of the GAIKER-IK4 Technology Centre, which allows them to harness their knowledge and +30 years of experience in the development, processing, and characterisation of plastic composites, to research materials, processes and post-processes related to additive manufacturing and to provide services to companies that will ultimately improve their processes and products. Through Additive and Composite manufacturing, GAIKER-IK4 aligns its knowledge within the field of digital manufacturing and Industry 4.0. GAIKER-IK4 started working with additive manufacturing technologies back in 2010, with the purchase of FDM-technology professional equipment to print ABS-based prototypes and models. Since 2012, GAIKER-IK4 has become equipped with open-source printing equipment and has gained extensive knowledge in the formulation, characterisation and printing of thermoplastic compounds for additive manufacturing, using its experience and means for compounding and formulating and characterising resin as its foundation. 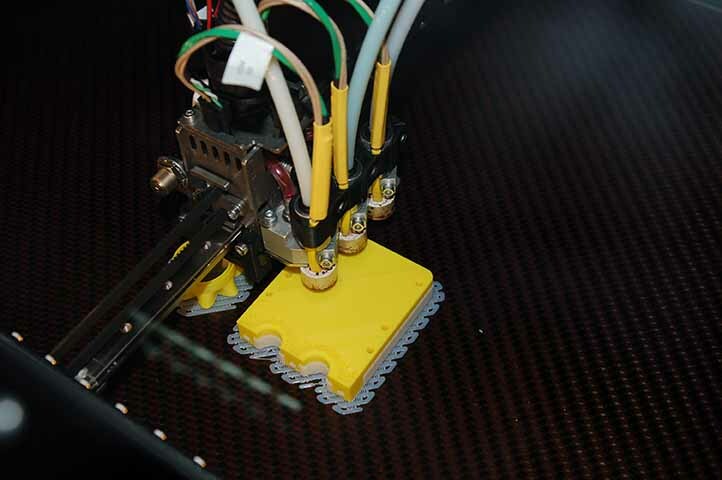 In the field of 3D printing, GAIKER-IK40’s main lines of work are: the development of new functional materials and composites, the adaptation of traditional polymer materials to 3D printing, and the combination of additive manufacturing in the development of products and processes with other plastic and composite moulding and forming technologies. In this sense, the Technology Centre has a broad portfolio of plastic and composite pilot plants, such as the injection, compression, thermoforming, rotomoulding, sheeting, RTM-infusion, filament winding and pultrusion plants. It also has capacity to develop post-treatment finishing and functionalisation processes by means of the application of paints and coatings. Tailored formulation of experimental pellet and filament batches for 3D printing of 1.75 mm and 2.85 mm (diameter). Adaptation of thermoplastic composites in 3D printing filaments. Definition of the product technical and process datasheets. Determination of the qualitative and quantitative composition of 3D printing material. Design and elaboration of models, parts, inserts and tooling through 3D printing, using FDM technology. Topological optimisation. Evaluation of printed moulds for short production series in the transformation processes of thermoplastics and composites. Optimal adjustment of process printing parameters. Physical, surface and mechanical characterisation and fire performance of the printed products according to standards (ISO, UNE, ASTM, DIN, BS). Application of post-processes and elaboration of processing guidelines and 3D printing protocols related to specific materials and final parts. Sustainability assessment of the additive manufacturing process through Life Cycle Analysis (LCA), environmental and financial methods. Development and implementation of recycling systems. In vitro toxicity assessment in ex vivo models (digestive tract, lung, heard, brain...) of the emissions of nanoparticles from 3D printing that have been collected on site. Creation of protocols. Materials for 3D printing with extruded filament deposition technology, based on lignocellulosic biomass by-products. Interreg Sudoe Project. Functional 3D printing compounds for FFF technology, based on carbon waste from the manufacturing processes of the aerospace sector. IHOBE Circular Economy Project. Thermoplastic compounds for 3D printing of models for investment casting and plastic moulds to create functional parts by injection. Etorgai Project. Materials and equipment to obtain printed architectural structures using printing filaments with unconventional dimensions based on recycled thermoplastic materials. Hazitek Strategic Project.